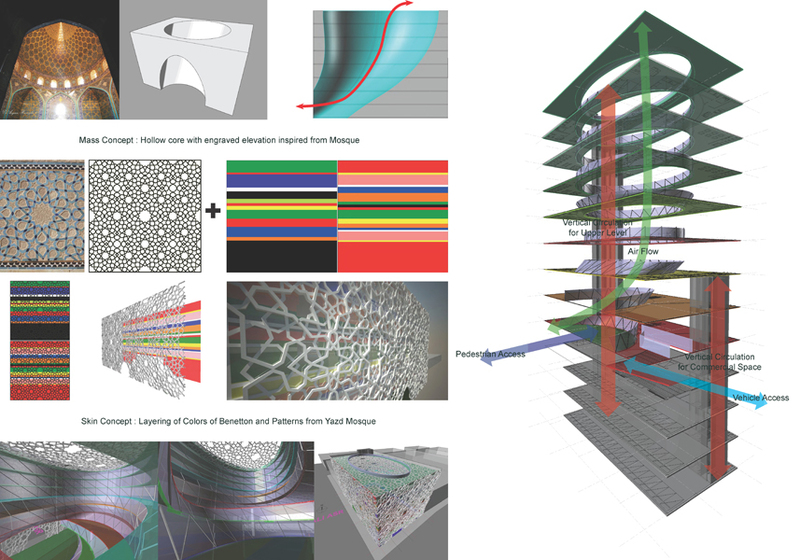 The scheme for a new multistory building at Vali Asr Ave is a hybrid space between global culture and local culture. 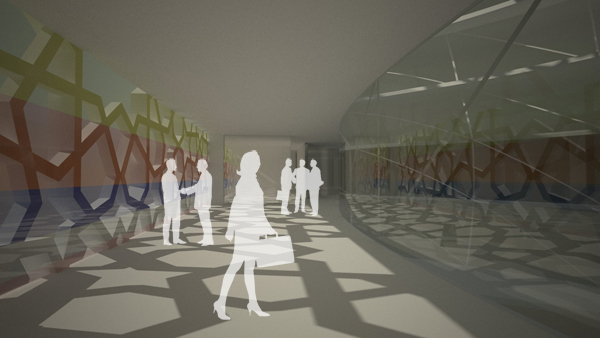 Absorption of local culture into modern architecture was a key question to design a new building. 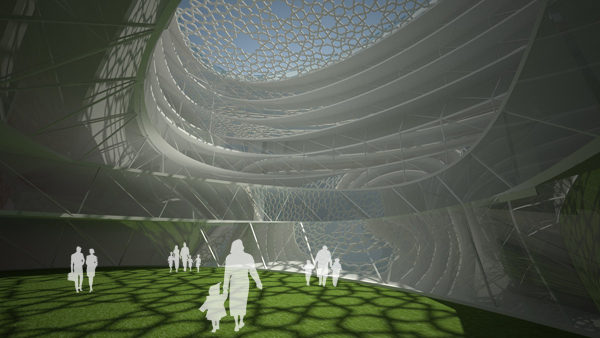 Creating a mixed culture of Iran and Benetton through architecture was a goal of this proposal. 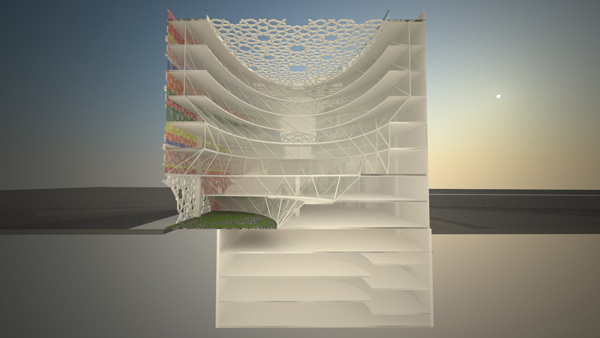 While it stands as a glass box, which dominates whole site, inside hollow space creates an open green area. 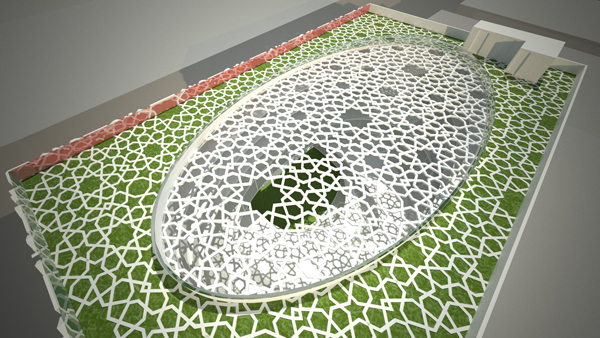 Inspired by traditional Mosque architecture, Façade of the building is engraved and led into the green court yard, which is connected to hollow core space. This court yard will be used as open public space and also meets green area requirement. Hollow core provide sunlight and air, while it resolve required floor areas. Since it is connected to court yard on ground level, rain and snow will fall through. The new building will hold nature in its center. 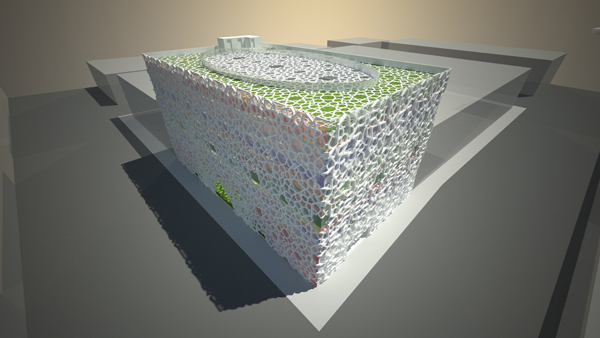 Skin of the building is layering structure of glass curtain wall and Islamic pattern structure. western culture (Benetton) and local culture (a pattern of Yazd Mosque). Commercial area on ground level can be accessed through the court yard from street level. When people enter into the court yard, they experience vertical opening, which absorb the sky. Since shape of commercial space on levle1, office space on level2 has a big balcony. Typical office space locates on level 3 and 4. Space is subdivided into 2 big office zones, a small office zone, rest area and 4 meeting rooms. Since floor size is reduced on level 5 and 6, it has 2 big office zones and a rest area. On level7, 3 apartments locate. Overall layout of the space is symmetry and vertical circulation is locates on the corner of north-east.